If 13 is an unlucky number, Nalini Singh has somehow managed to avoid the jinx. 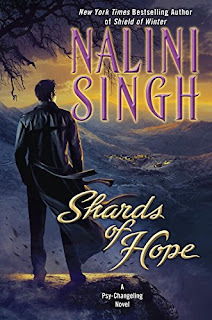 Her Psy-Changeling series is going strong with the release of the thirteenth book, Shards of Hope. Singh has created a rich and varied world, which gives her plenty of maneuvering room for her stories. She has the Psy, who started out the series trying to be as emotionless as the Vulcans--except there were fatal cracks in the emotionless protocol known as Silence--the Changelings, initially focused on the DarkRiver leopards and SnowDancer wolves, and the humans. Shards of Hope focuses on the Psy, but Changelings and humans also play important roles. When the book opens, Aden, the leader of the onetime Psy Council enforcement arm known as the Arrow squad, and Zaira, his second-in-command, have been captured. Wounded and with their mental abilities blocked, they know they’re slated for interrogation and torture. They manage to escape but find themselves in a wilderness with their pursuers searching for them. They manage to find sanctuary with a new Changeling leopard pack but are not fully trusted. Psy have always been hostile to Changelings, whom they cannot destroy with their mental powers except at close range. Remi, the pack alpha, initially fears Aden and Zaira’s arrival is a ploy to infiltrate his den. Remaining with the pack while their injuries heal, Aden and Zaira find the old barriers between them breaking down. Aden welcomes the change, while Zaira, because of the emotional scars of a tormented childhood, sees herself as no good for him. But the world is changing, too. The Psy are learning to embrace their emotions, and Aden wants the best of that experience for himself and his Arrows. He wants them to have lives based on their own desires, not just orders or the blandness of the now-discredited Silence. Bonding with Zaira would not only give him his heart’s desire but demonstrate to the veteran Arrows, who grew up under Silence, that they can find a new path. Unfortunately for Aden’s plans and Zaira’s resistance to them, someone has targeted the Arrow squad and their leader. Bring Aden down, the enemy thinks, and the Arrows lose their mystique, which is the strongest prop for the Psy government. While Zaira doesn’t think she’s good for Aden, she isn’t going to stand by while someone attacks him. As the two of them battle her personal darkness and this conspiracy, they also have to deal with a Psy serial killer and with Arrows who can’t cope with indulging their emotions after a lifetime of Silence. The struggle to bring the squad into a new world, with its chances for love and freedom and true family, draws Aden and Zaira steadily closer. But the resulting emotions feed the inner darkness Zaira fears. As usual with this series, Singh puts her characters through an emotional wringer set against the canvas of a larger plot, the rough adjustment of society, and especially the Psy, after the fall of Silence. Aden and Zaira are smart and brave and sympthetic. Their relationship has depth and a strong conflict that sustains the story. Familiar characters from earlier books play important roles, and new kinds of Changelings begin to carry some of the story’s load, broadening the scope of the world further. This latest installment of the series offers a satisfying romance and plenty of action (and one very new, very seriously cool Psy power) set in an evolving story world. I highly recommend it. Since reading Anne McCaffrey's Tower and Hive series where the 'primes' exhibit extraordinary mental abilities, I have had a fascination for books involving psychic powers. In real life too, there are many stories of mental healing (energy medicine) where the power of thought can stimulate the body's self healing. Quantum Touch is probably the easiest to master .... suggesting that there is a realm of skill and knowledge involving the mind just waiting to be discovered. All this gives novels of psychic power a certain poignancy ... they just might be touching a future reality! I think I have to try Nalini Singh. I suspect her created worlds are much harsher than those of McCaffrey, but a 5-star rating here makes it a must try for me! I've not read her as yet but this does sound like something I would really enjoy - thanks.